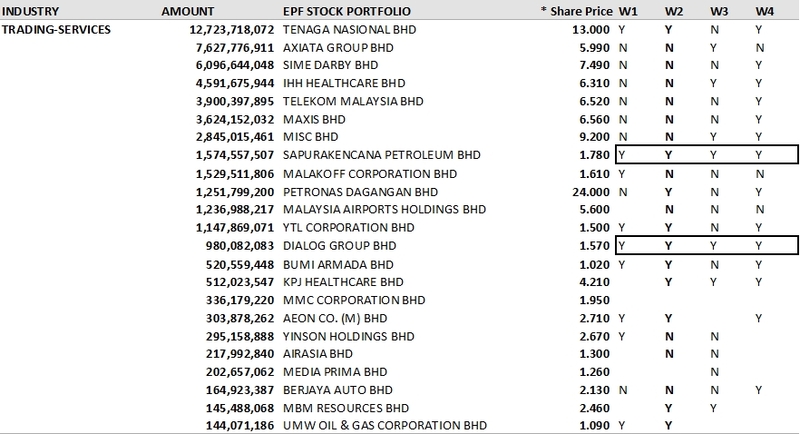 Employee Provident Fund (EPF) Portfolio displays a list of companies that EPF has interested in. You may notice SapuraKencana Petroleum Bhd and Dialog Group Bhd from W1 to W4 is in the buying stage. As for Finance Industry, Malayan Banking Bhd stays at the top, CIMB and BIMB is collecting the buying stage for W1 to W4. For Industrial Products, Petronas Chemicals Group Bhd stays at the top, Ta Ann Holdings Bhd is at selling stage from W1 to W4. For Plantation, Kuala Lumpur Kepong Bhd stays at the top, IJM Plantation Bhd is at selling stage from W1 to W4. For IPC Industry, Time Dotcom Bhd is at selling stage from W1 to W4. For Consumer Industry, UMW Holdings Bhd at buying stage from W1 to W4. However Tan Chong Motor Holdings Bhd at selling stage from W1 to W4. For Construction Industry, Hock Seng Lee Bhd is at selling stage from W1 to W4. For Properties Industry, Most companies is at buying stage from W1 to W4. For REITs Industry, Sunway REITs and Axis REITs is at buying stage from W1 to W4. For Technology Industry, both companies below does not show signs of buying from W1 to W4. SECOND, Properties has become the favorite choice at the buying stage from W1 to W4. Syarikat Takaful Malaysia Bhd has a maximum range 3.090 - 16.600 which carries 437.22% returns if price jump from 3.09 towards 16.60. 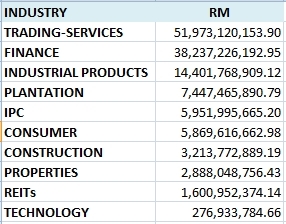 However, lets row down at the bottom of the list, Nestle (M) Bhd, is having maximum 11.03% return of investment if price from 68.00 jump to 75.50 in a year (52 weeks). Therefore in order to earn as much as % in a year, it is advisable to look for higher % return of your investment. The price changes for Malayan Banking Bhd and Public Bank Bhd still in the range of 16% - 18% maximum in a year. Eastern & Oriental Bhd, IGB Corporation Bhd, and BIMB Holdings Bhd are at the lowest price point. Petronas Chemicals Group Bhd, Inari Amertron Bhd, and Globetronics Technology Bhd are at the highest price level. (a) Tan Chong Motor Holdings Bhd although having 25.44% current price level, which is suppose to be good, still it does not gain support from EPF, however as for Ta Ann Holdings Bhd, it is at the 92.66% against the highest yearly price, therefore selling is good. (b) The highest price level Dialog Group Bhd, 65.85% against the yearly highest price level, is able to attract attention from EPF, however it is advisable to buy based on the lowest price % against yearly highest price level. SUMMARY, it takes everyone to complain how Fixed Deposit would earn you a small 3.5% interest a year for a RM10,000 investment which is RM350 per year. Would you be able to buy and sell two times with at least 5% profit per time which makes you 10% per year for a RM10,000 investment, = RM1,000 per year. 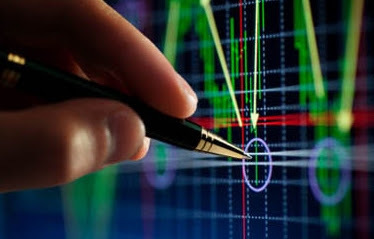 The above calculation would at least give you some idea to buy at a lower price and sell it at possible higher price. 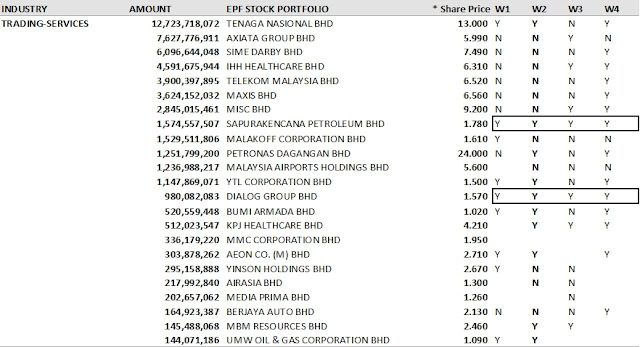 NOT FORGETTING, there are some shares below which need a little bit careful, New and Non Active from the EPF Portfolio. Not all shares is actively traded, therefore, the following would probably need a longer time to achieve the profit % we needed to secure. HOW ABOUT WEEKLY CHANGES? There are some shares tend to be sold and bought over 5%. Lingkaran Trans Kota Holdings Bhd is the highest bought quantity in 6.27% percentage, while Ta Ann Holdings Bhd has the highest sold quantity 9.07% as in quantity. Let's see how do we calculate Lingkaran Trans Kota Holdings Bhd? Units (38,320,900 - 36,059,500) divide by 36,059,500 =6.27%. In other words, I want to increase 6.27% shares in Lingkaran Trans Kota Holdings Bhd, it is probably to increase 2,260,930 units of shares. QUESTION? 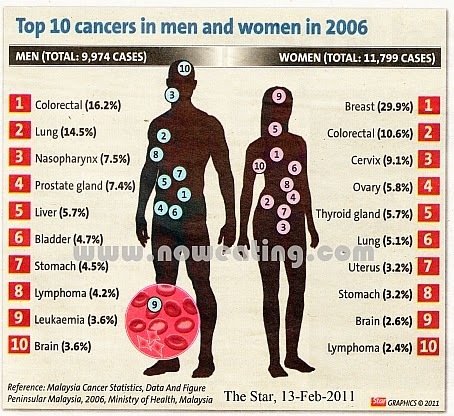 Some of you would think of the information is gathered actually is 15 December 2015 rather than 18 December 2015 data based on the Bursa Malaysia website. Well, the share price level is actually swing around that level even for a week or a month. This is what we could see Ta Ann Holdings Bhd has been consistently sold for 4 weeks. While Dialog Group Bhd is consistent been bought for 4 weeks. So is there a good price to buy and sell even though Bursa Malaysia is late 3 days delivering the information? Another Question is would the delivery of the dividends impact the timing of selling and buying? Let's continue study in my next week analysis. The above article is for self-improvement. Although looking at financial reports seems pointless and boring, but filtering above company would at least get us going. Furthermore, it is the EPF selected shares.